Unit has a 3,500# capacity. Fill head features a bulk bag inflation system with pneumatically actuated butterfly valve. Fill head features dust take-off port with pneumatically actuated butterfly valve for venting of displaced air. Loop-Lok™ powered bag strap release and engagement system is safe, and adjusts in seconds without tools. Inflatable USDA/FDA approved spout seal creates a dust-tight connection to the bag fill spout, actuated by an ergonomic foot pedal to inflate and deflate spout. 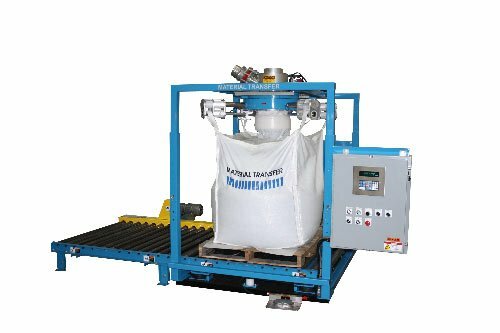 Base of unit features a pneumatic conveyor lift system to allow slacking of bag straps for release after fill process is completed. Unit features an in-feed CDLR conveyor and base CDLR conveyor. Unit includes 10′ long gravity roller discharge conveyor with supports & end stop (not shown). Gain-in-weight scale system with NTEP approved platform scale. Scale system sends signal to roller gate (not shown) to initiate full open, dribble, or close position. When target weight is reached, slide gate closes, straps and fill spout release, bag is powered out of filler base down the discharge conveyor for operator pick-up. Control enclosure features a panel mounted digital weight indicator and momentary contacts for operation.